Pull the chicken when you get home from the grocery store and allow it to cool in the fridge before mixing it with the guac. Mix the chicken with the guac. Build your tacos on the tortillas, starting with the guacamole-chicken mixture, followed by some salsa, sour cream, grated cheese and cilantro. 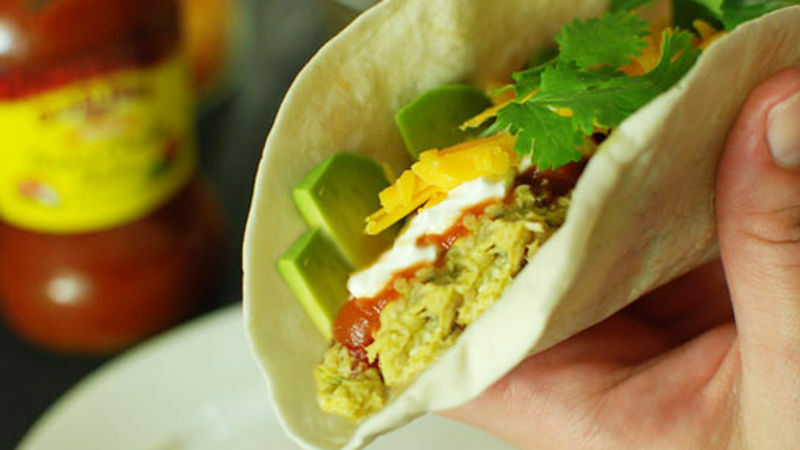 For a cool hot-weather meal, try these easy tacos made with guacamole and chilled chicken. I don’t know if you guys have been outside recently, but man, it’s hot! It’s soooo hot, that some nights I don’t even want to turn on the microwave! I mean, you know it’s getting hot when the oven becomes out of the question, the stovetop is next to go, but when even the microwave is off limits, that’s when things have gotten really unbearable. These Easy Guacamole Chicken Tacos are a quick and easy alternative to cooking that don’t require any heating up, and are even served cooled to help you beat the heat. The trick is mixing a store-bought rotisserie chicken with guacamole as the base of the tacos. It’s like a fun twist on chicken salad! Top with some salsa and cooling sour cream and you have really delicious tacos on the table quick with no heat necessary! Pull the rotisserie chicken when you get home from the store and get it into the fridge. This helps it cool down quick. Tonight I made a quick guac, but store bought works fine for this recipe. If you want to make your own, here are some great guac recipes for you. The chicken all mixed together. Dan Whalen thinks avocado is the new mayo. He has been blogging for over 5 years at The Food in my Beard; check Dan's Tablespoon profile often to try his recipes with creative international spins!